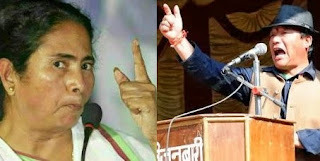 Chief minister Mamata Banerjee on Friday threatened that her government will not allow any bandh in the Darjeeling Hills and will resist any attempts to disrupt the development activities in the Hills. She was addressing a gathering at Kalimpong during the day and urged several development boards in the Hills to work for the economic growth of the Hills. "You carry forward several development schemes which you have already taken up. Our government will give money for such schemes. Don't worry for money. You just go ahead with your goals for developing the Hills," the chief minister said, making it clear that her government would not allow any disruption in the ongoing development in Darjeeling. Meanwhile, the Gorkha Janamukti Morcha (GJM) chief Bimal Gurung has threatened to go for a bandh in the Hills on September 28. "The chief minister is coming to Darjeeling very frequently and announcing several projects for the people." "Yesterday, she had announced that her government has given Rs 400 crore to the Gorkha Territorial Administration (GTA). We want a detail break up of this Rs 400 crore which, according to the chief minister, has been given to the GTA. If the chief minister fails to give any break-up by September 27, we will go for bandhs in Darjeeling from September 28," Gurung said on Friday. GJM insiders, however, said that their chief was annoyed with the chief minister as she had announced to set up a development board for the Gurungs in Darjeeling. "The chief minister has already formed development boards for ten tribal groups in Darjeeling including Lepchas,Bhutias, Tamangs. Now she has announced to set up Gurung development board in Darjeeling after the Pujas. Gorkha Janamukti Morcha may call bandh against CM in Darjeeling - Chief minister Mamata Banerjee on Friday threatened that her government will not allow any bandh in the Darjeeling Hills and will resist any attempts to disrupt the development activities in the Hills.